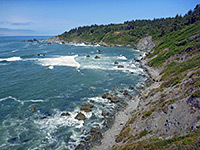 Most state-managed preserves along the far northern coast of California are relatively undeveloped, and free to enter, but Patricks Point State Park is an exception, charging fees of $8 per vehicle, and offering many facilities such as three campgrounds, a visitor center, picnic areas, ranger programs and a network of short trails. The park occupies a three mile section of the coastline north of the little village of Patricks Point, where the land curves outwards to form a headland, covered by a mix of thick, ferny woodland and open, grassy clearings. The shoreline includes one large stretch of sand (Agate Beach, named after the wave-polished, semi-precious stones that may be found here) and several much smaller beaches, though in most places the land drops down steeply to inaccessible cliffs and boulders, and in general the coast is not especially scenic, lacking any sea arches or other large-scale eroded formations, instead lined only by jumbles of smaller rocks. The park is very popular however, both for camping and day trips, the other main activities being hiking, painting, beachcombing, and whale watching (from October to April). Fog can be present any time of year, often persisting all day in summer; spring and fall are more likely to see clearer days, especially during the afternoon. The state park is reached via Patricks Point Drive, a quiet, 5.5 mile route running along a belt of land between US 101 and the ocean, offering some brief but spectacular views out to sea, and passing a mix of woodland and private residences. The road begins in the south at Trinidad, and ends at a junction with US 101 (exit 734), near the park entrance. The fees ($8 for day-use, $35 or more for camping, in 2015) are paid to an attendant at the entrance station, beside which is the visitor center; after here, the road splits into two, accessing the north and south sections of the park. Side roads lead to the three campgrounds (Agate Beach, Penn Creek, Abalone) and about eight main parking areas, the majority close to the coast. Short footpaths reach overlooks or descend towards the water's edge, and the 2 mile Rim Trail links most of them. The park interior is largely wooded - such species as red alder, Sitka spruce, pine, Douglas fir and hemlock - though meadows break up the trees and allow many wildflowers to flourish, while the bluffs overlooking the ocean are more overgrown, with a greater variety of plants. 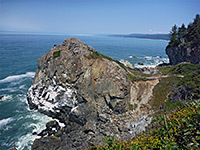 Two other points of interest inland are the high point (287 feet) of Ceremonial Rock, an isolated peak that gives partial sea views northwards, and Sumêg Village, a reconstructed Yurok settlement, built in 1990, that includes dwellings, a dance pit, a sweathouse and a redwood canoe. Nearby is a small wildflower garden. A few trails connect these two sites with the campgrounds, and cross the forested interior, but most people head for the viewpoints and the paths close to the ocean. 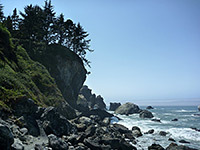 The north section of the park contains most of Agate Beach, a wide strip of grey sand beneath layered brown cliffs that extends for 1.5 miles to the settlement of Big Lagoon, then merges with a narrow spit separating the saltwater lake of the same name from the ocean - part of Humboldt Lagoons State Park. 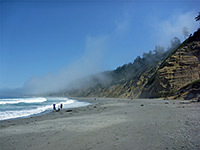 The south end of Agate Beach is accessed by a short trail that descends steeply by nearly 200 feet, a difficult walk for some people, and ends beside the small stream of Agate Creek. To the south, the sand gives way to boulders and cliffs, which extend westwards to a promontory near Mussel Rocks, the next place where the shore is accessible by trail. There are no sandy areas here, and the point is not much visited. Walking further south along the coast is not possible owing to overhanging cliffs, with a leaning tree on top, a feature seen also at the next access point, the most popular, at Wedding Rock, an isolated peak (once a sea stack) projecting out into the ocean a little way. A short path climbs to the top, and another leads to a pebbly beach on the north side. Continuing south, two more spur paths lead to the overlooks of Patrick Point, quite high above the ocean and partly enclosed by trees, and Rocky Point, where the vegetation is less and the views better. Past here, all of the southern half of the park is much less visited, and there is only one more major shoreline access point, at Cannonball Beach, also known as Palmers Point Beach, which is formed of pebbles rather than sand.